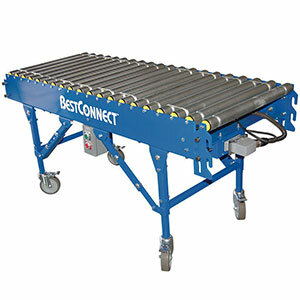 BestConnect is a modular system of rigid, powered roller conveyors with features that allow fast configuration and reconfiguration. Steel framed conveyor sections roll into place on casters that lock for stability during use. Quick latching connectors and plug-and-play interfacing make system setup a cinch, and when application needs change, simply disconnect sections and rearrange into a new layout. This 7' 6" straight conveyor uses photo eye sensors and zones of powered rollers to accumulate packages for sortation or loading. Ready for use with other 24" wide BestConnect conveyors; also compatible with NestaFlex gravity and BestFlex powered flexible conveyors that have proper connection brackets and interfacing kits installed. Use these modular components to create nearly endless conveyor system configurations for package loading/unloading and sortation. When conveying needs change due to seasonal shifts in demand or evolving application requirements, just add or remove conveyor sections and rearrange as needed. Simple 16-pin connector interfacing and quick latching brackets let you join and detach modules with ease, so setup and reconfiguration require very little downtime. Standard straight conveyor activates all rollers in unison to move products down the line. Accumulation conveyor uses zones of powered rollers and photoeye sensors at the end of each zone to control package movement. When a package is detected in the final zone, the zone's rollers halt. The zones upstream will only release a package if the next downstream zone is empty. This allows a row of packages to accumulate for loading or sortation. Curved conveyor sections effect turns in system layout. Tapered rollers help maintain product orientation through the right or left turn. 90° curvature is standard. A merge joins one conveyor line to another at a 30° or 45° angle. Note that collision prevention logic is not a standard feature. Steel balls set into a tabletop create an ideal surface for rolling and rotating packages in any direction. Use ball transfers to sort packages manually or orient them for downstream processes. Additional conveyor sizes may be available upon request. Special brackets installed on the ends of a BestFlex powered flexible conveyor or NestaFlex gravity flexible conveyor permit connection to a BestConnect system. 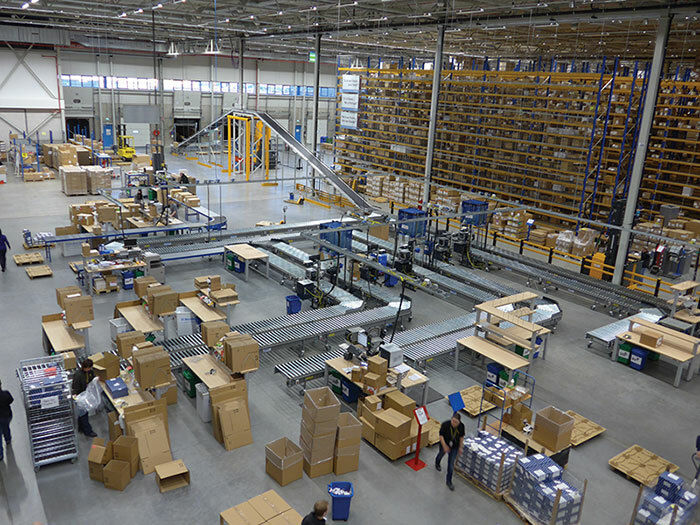 For BestFlex and BestConnect conveyors to share operational controls, additional interfacing equipment is needed. Contact us for assistance.